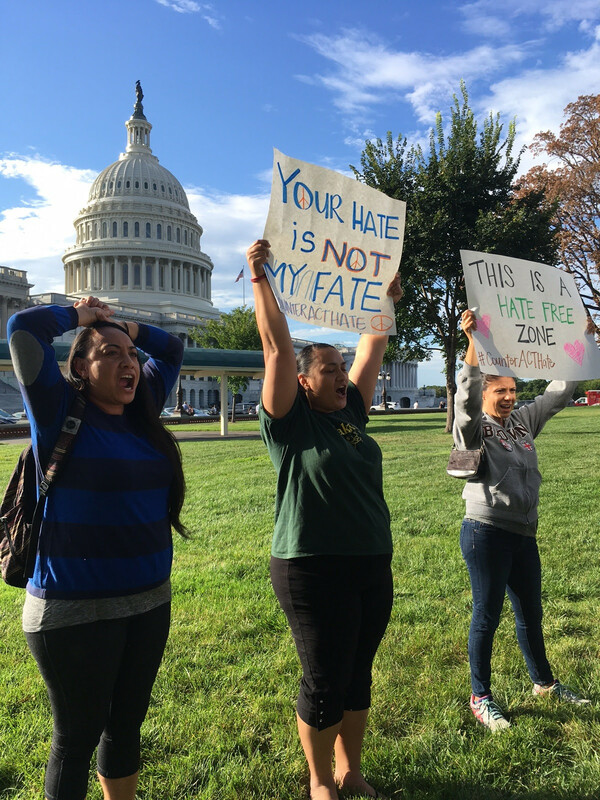 WASHINGTON, D.C. (Sept. 13, 2017) — Hundreds of leaders from the National Coalition for Asian Pacific American Community Development (National CAPACD) and South Asian Americans Leading Together (SAALT) rallied together Sept. 12 to challenge the administration’s attacks on immigrants and people of color. The rally was to address emboldened white supremacy that has impacted safety in local neighborhoods. Asian Americans and Pacific Islanders from Boston to Honolulu stood together to #CounterActHate in our #OurNeighborhoods, chanting “No Ban, No Wall, Sanctuary for All” to demand a reversal of policies that target, profile and penalize Muslim and immigrant communities, pushing back on Islamophobia, xenophobia and white supremacy. The rally was also to advocate for the Dream Act in Congress. Chinatown CDC Executive Director Rev. Norman Fong connected the Muslim Ban and current Islamophobic sentiment to a long legacy of xenophobia shaping anti-immigrant rhetoric. “My dad was in prison because there was a ban against the Chinese, the Chinese Exclusion Act. He couldn’t go to school. He couldn’t get into a hospital. He couldn’t get a job. He had to be a farmworker.” Rev. Fong also shared his own personal experiences, as a Chinese-American growing up in San Francisco’s Chinatown and being targeted by hate violence. Though decades apart, the experiences of South Asian immigrants in Queens today too closely reflect the experiences of a Chinatown kid growing up in the shadows of the Chinese Exclusion Act of 1882. 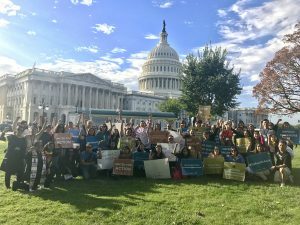 U.S. Rep. Judy Chu (CA-27), U.S. Rep. Maxine Waters (CA-43), and U.S. Rep. Ted Lieu (CA-33) joined the rally and stated an unwavering commitment to passing the DREAM Act.